Microsoft Visio Standard 2016 is a powerful diagramming platform with a rich set of built-in stencils. Microsoft Visio Standard 2016 helps you simplify complex information through simple, easy-to-understand diagrams. 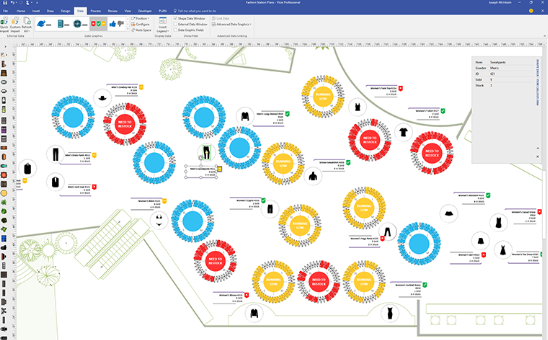 Create network diagrams, flowcharts, maps, and floor plans with refreshed shapes and templates. Perform common flowcharting activities with ease, thanks to the familiar Office experience. Collaborate however you want. Add comments to a diagram or shape, or chat via Skype for Business directly from Visio. Share diagrams easily with anyone across your organization, from nearly anywhere. The one-stop diagramming solution to simplify and communicate complex information. Customize professional-looking diagrams using a rich set of effects and themes and apply a completely different look to your design in just a few clicks. Perform common diagramming activities (change shape, auto align and position, or duplicate and reorder pages) with an intuitive experience while preserving metadata and connections of the shapes. Connect diagrams to real-time data to make decisions quickly. Link your shapes and diagrams to popular source files and, with applied shape formatting, automatically update to reflect changes in the underlying data in Visio or through Office 365 apps and services. 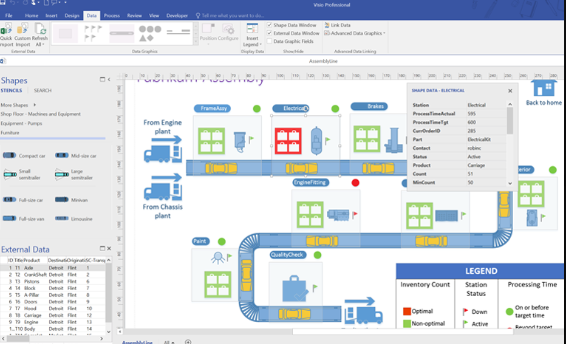 Microsoft Visio Standard 2016 Retail Box is the best diagram software, i used it for all my projects to diagram workflows, vmware connections, i used all the stencils that are create it for visio, it almost have everything for every brand. and also it helps me to make my presentations easy, for the user of our internal LAN and our software, i also used it to teach the workflows, the other thing i like the most is that integrates. Office experience allows you to perform common flow charts with ease. Add comments and share diagrams easily with anyone across your organization. Visio2016 Standard is classic. Pretty much everyone has heard of it and it's used by countless people for a good reason. Visio is amazing at what it does. You can keep it simple and use it to just make some basic diagrams, or your can get fairly complex and tag a ton of metadata into your objects. I really built out Visio is much more than just a visual representation, it's a quite robust form of documentation when used to it's full extent. I find the Microsoft Visio Standard 2016 very intuitive and easy to experiment with. They provide an assortment of templates, but it is very easy to create a new flow chart from scratch, by drawing a starting shape and using connector lines. If you are already familiar with designing powerpoint diagrams, the concept is similar, except with Visio, it is much more effortless to align objects, and the software will automatically expand your figure onto another page if necessary.The Visio 2016 defaults to blue shaded boxes which are difficult to read and not very printer-friendly. I have to manually fix it every time. The other limitation is that when you want to save Visio or transfer your image into a different program (i.e., going into a powerpoint presentation), the image doesn't always transfer in exactly the way because it may appear slightly differently. I also wish there were more icons available, so I could use them as objects in presentations. There is a way to modify them, but there is a rather limited selection, since the diagrams were intended to be used for business or work purposes (not as a general database of copyright free clip art).